There are many nice things about writing a blog. For one thing, people reading it regularly get to know something of your tastes and interests, and they are occasionally kind enough to pass on information about something that they think you might like. Usually that takes the form of a favourite album or website, but sometimes people tell you about their own work. I don't think that I've ever had an artist contact me about their own album before, but there's a first time for everything. 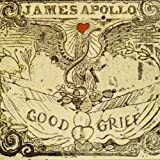 James Apollo sent me a very non-pushy little email suggesting that I might like a couple of the tracks on 'Good Grief'. He sensibly has a stream of the whole album so that you can listen before you buy, so I gave it a go. 38.4 minutes later, I was visiting the iTunes Music store to buy the album. 1 I really miss sleeve notes when I buy albums from the iTunes Music Store.